Ozial's brother was Ebenezer Ballou. Lorinda & Emily were sisters. *Note the change from Oziel to Ozial. 1. 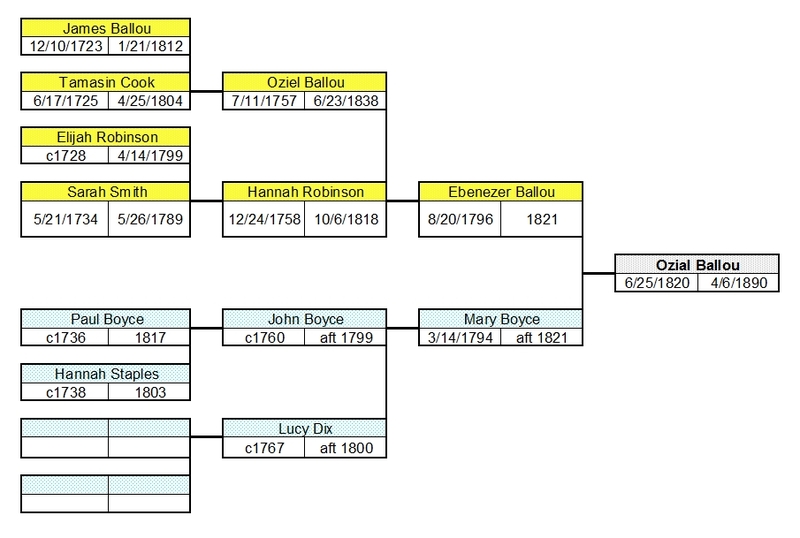 OZIAL7 BALLOU (EBENEZER6, OZIEL5, JAMES4, JAMES3, JAMES2, MATURIN1) was born 25 Jun 1820 in Richmond NH, and died 06 Apr 1890 in Richmond NH. 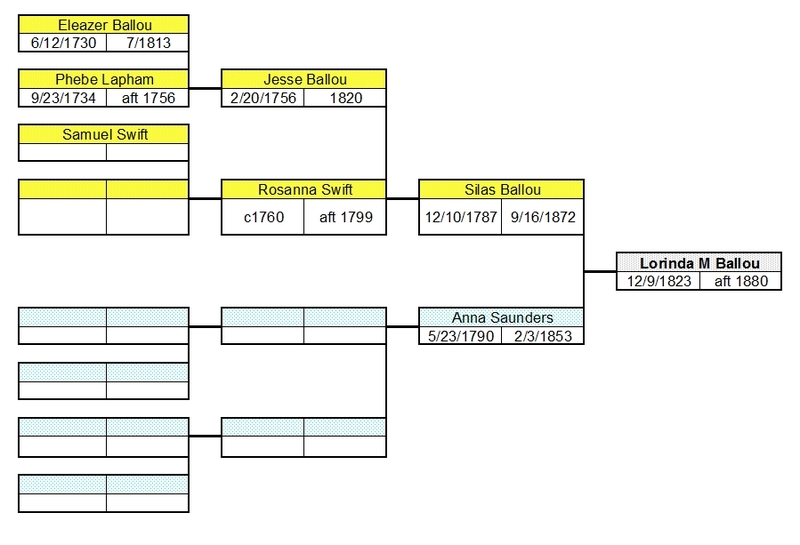 He married (1) LORINDA M BALLOU in By 1856, daughter of SILAS BALLOU and ANNA SAUNDERS. She was born 09 Dec 1823 in Richmond NH, and died Aft. 1880. 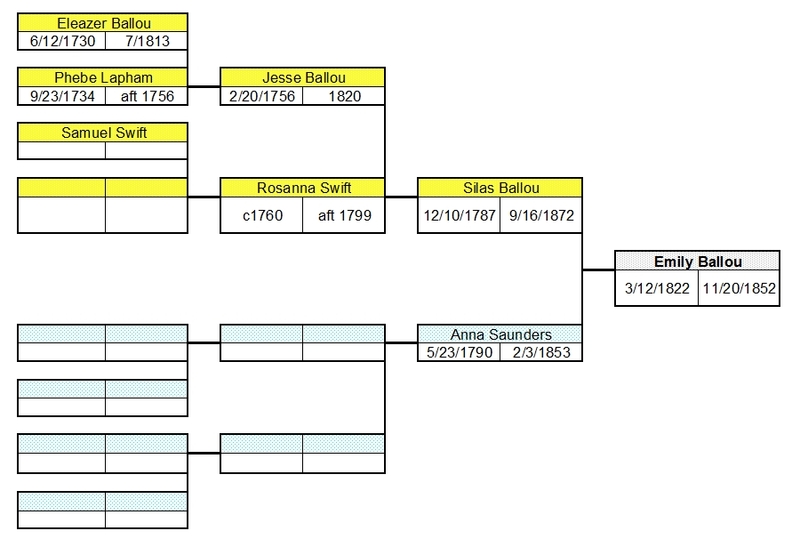 He married (2) EMILY BALLOU 02 Apr 1840 in Richmond NH, daughter of SILAS BALLOU and ANNA SAUNDERS. She was born 12 Mar 1822 in Richmond NH, and died 20 Nov 1852. 2. i. WILLIAM J8 BALLOU, b. Oct 1855, NH; d. Aft. 1930. 3. ii. EUGENE WEBSTER BALLOU, b. 28 Jun 1857, Gardner MA; d. 1926, Richmond NH. iii. GEORGE M BALLOU, b. Abt. 1861, NH; d. 31 Dec 1933, Keene NH. iv. ALICE JULIA BALLOU, b. Abt. 1862, NH; m. (1) ? DAVENPORT; d. Bef. 1892; m. (2) JOHN SAMUEL HILL, 08 Jun 1892, Braintree MA; b. Abt. 1857. 4. v. HENRY EDMUND8 BALLOU, b. 24 May 1841, Richmond NH/Gardner MA; d. 28 Aug 1905, Reading MA. 5. vi. EMILY JANE BALLOU, b. 13 Feb 1843, Gardner MA; d. Aft. 1920.
vii. OZIAL A BALLOU, b. Abt. 1851, Richmond NH; d. 14 May 1883, Richmond NH. 2. WILLIAM J8 BALLOU (OZIAL7, EBENEZER6, OZIEL5, JAMES4, JAMES3, JAMES2, MATURIN1) was born Oct 1855 in NH, and died Aft. 1930. He married AMY WHIPPLE 24 Jun 1880 in Royalston MA, daughter of OTIS WHIPPLE. She was born May 1861 in CT, and died Aft. 1930. 6. i. CORA ELEANOR9 BALLOU, b. 05 Jul 1881, Richmond NH; d. Aft. 1940.
ii. MYTIE AMY BALLOU, b. 09 Aug 1883, Richmond NH; d. Aft. 1905; m. GEORGE HERBERT EAMES, 01 Nov 1905, Chelsea MA. 3. EUGENE WEBSTER8 BALLOU (OZIAL7, EBENEZER6, OZIEL5, JAMES4, JAMES3, JAMES2, MATURIN1) was born 28 Jun 1857 in Gardner MA, and died 1926 in Richmond NH. He married MAUD S WHIPPLE 30 Apr 1887 in Richmond NH. She was born 1869 in NH, and died 1953 in Richmond NH. i. ELNORA M9 BALLOU, b. 15 Sep 1888, Richmond NH; d. 15 Jan 1947, Richmond NH; m. ALBERT M MACDONALD, 22 Nov 1919, Marlboro NH; b. Abt. 1899, MA; d. 23 Dec 1936, Winchester NH. ii. EARL E BALLOU, b. 24 May 1892, Richmond NH; d. 1893, Richmond NH. 4. HENRY EDMUND8 BALLOU (OZIAL7, EBENEZER6, OZIEL5, JAMES4, JAMES3, JAMES2, MATURIN1) was born 24 May 1841 in Richmond NH/Gardner MA, and died 28 Aug 1905 in Reading MA. He married (1) ABBIE E TOLMAN 19 Aug 1866 in Richmond NH. She was born Abt. 1847 in Richmond NH. He married (2) ABBIE M HOWARD 27 Jun 1870 in Charlestown MA. She was born Abt. 1856 in MA, and died Bet. 1880 - 1900. 7. i. MINNIE GRACE9 BALLOU, b. 18 Feb 1873, Boston MA; d. Aft. 1940.
ii. ALICE (DAISY) MAY BALLOU, b. 10 Mar 1875, Boston/Riverside MA; d. Aft. 1880.
iii. LILLIA FLORENCE BALLOU, b. 02 Aug 1878, Brookline MA; d. Aft. 1880.
iv. HENRY E BALLOU, b. 31 Aug 1880, Fitchburg MA; d. 04 Oct 1880, MA. 5. EMILY JANE8 BALLOU (OZIAL7, EBENEZER6, OZIEL5, JAMES4, JAMES3, JAMES2, MATURIN1) was born 13 Feb 1843 in Gardner MA, and died Aft. 1920. She married (1) STEPHEN W MARTIN 06 Jun 1860 in Keene NH. He was born 13 Apr 1836 in Richmond NH, and died 16 May 1862. She married (2) SIDNEY B BOWEN 04 Mar 1867 in Royalston MA. He was born 28 Dec 1846 in Richmond NH, and died Bet. 1910 - 1920.
i. ADDIE EMMOGENE MARTIN9 BOWEN, b. 27 Mar 1861, Royalston MA; d. Aft. 1930; m. ARTHUR HAROLD ROSS, 29 Jan 1911, Worcester MA; b. Abt. 1879, Ludlow VT; d. Aft. 1930. 8. ii. MINNIE MYRTLE9 BOWEN, b. Mar 1870, Swanzey NH; d. 25 Nov 1911, Ringe NH. 6. CORA ELEANOR9 BALLOU (WILLIAM J8, OZIAL7, EBENEZER6, OZIEL5, JAMES4, JAMES3, JAMES2, MATURIN1) was born 05 Jul 1881 in Richmond NH, and died Aft. 1940. She married (1) ARCHIE L THOMPSON 03 Jan 1899 in Hinsdale NH - later divorced. He was born Abt. 1877 in Winchester NH, and died Aft. 1940. She married (2) CHARLES GOODNOW WARE 12 Apr 1905 in MA. He was born Abt. 1882 in OH, and died Aft. 1940.
i. LOUISE W10 WARE, b. Abt. 1915, PA; d. Aft. 1940. 7. MINNIE GRACE9 BALLOU (HENRY EDMUND8, OZIAL7, EBENEZER6, OZIEL5, JAMES4, JAMES3, JAMES2, MATURIN1) was born 18 Feb 1873 in Boston MA, and died Aft. 1940. She married (1) GEORGE H PHILBRICK 18 Jan 1892 in Boston MA. He was born Aug 1860 in Pittsfield NH, and died Bet. 1910 - 1920. She married (2) ? FASH Bet. 1920 - 1930.
i. HENRY EDMUND (EDWIN)10 PHILBRICK, b. 31 Dec 1892, Boston MA; d. Aft. 1940; m. ? ?, Later divorced. 9. ii. MYRTLE GRACIA PHILBRICK, b. 31 Jul 1909, MA - probably 1910; d. 02 Jul 1973, Orange CA. 8. MINNIE MYRTLE9 BOWEN (EMILY JANE8 BALLOU, OZIAL7, EBENEZER6, OZIEL5, JAMES4, JAMES3, JAMES2, MATURIN1) was born Mar 1870 in Swanzey NH, and died 25 Nov 1911 in Ringe NH. She married WILLIE EUGENE HALE 31 Dec 1890 in Richmond NH. He was born Dec 1861 in NH, and died Aft. 1940. 10. i. MYRTLE ADDIE10 HALE, b. 26 Jan 1892, Ringe NH; d. 07 May 1976, Gardner MA. ii. RALPH EUGENE HALE, b. 23 Feb 1893, Ringe NH; d. Aft. 1940. 9. MYRTLE GRACIA10 PHILBRICK (MINNIE GRACE9 BALLOU, HENRY EDMUND8, OZIAL7, EBENEZER6, OZIEL5, JAMES4, JAMES3, JAMES2, MATURIN1) was born 31 Jul 1909 in MA - probably 1910, and died 02 Jul 1973 in Orange CA. She married JAMES PARSHLEY 04 Sep 1934 in Strafford Corner NH. He was born 12 Nov 1909 in NH, and died Jul 1981 in New Durham NH. i. SON11 PARSHLEY, b. Abt. 16 Oct 1935; d. 16 Oct 1935, Rochester NH. 10. MYRTLE ADDIE10 HALE (MINNIE MYRTLE9 BOWEN, EMILY JANE8 BALLOU, OZIAL7, EBENEZER6, OZIEL5, JAMES4, JAMES3, JAMES2, MATURIN1) was born 26 Jan 1892 in Ringe NH, and died 07 May 1976 in Gardner MA. She married HERBERT LAWRENCE KING 22 Oct 1910 in Baldwinville MA. He was born 05 Dec 1892 in Templeton MA, and died Aft. 1930.
i. MADALYN MYRTLE11 KING, b. 19 Mar 1911, Templeton MA; d. Aft. 1940.